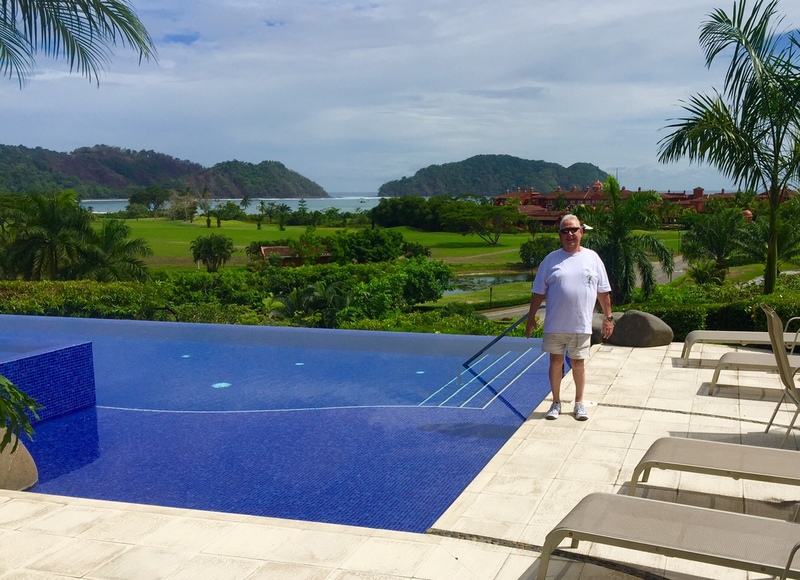 "CR Blue Marlin School Cline"
June 18, 2017: My old friend and client Danny Cline from West Virginia arrived here at my condo in the Los Suenos resort and Marina, today just after noon. We sat around the pool and had a 25 year old “Flor de Cana” cocktail and discussed our strategy for Danny to catch his eighth blue marlin on fly and hopefully a bunch more. Now this is Danny’s fourth trip here to my CR Blue Marlin School and he has caught 4 blue marlin and several sailfish here aboard the “Dragin Fly” with Captain James Smith and mates Berto and Roberto .Our goal for this trip is for Danny to get past 10 Blue Marlin in his career and possibly a grand slam on fly. We had a great Italian dinner at the Lantern Restaurant then went to sleep early. June 19, 2017: Danny and I had a late breakfast, swam in the pool, and I soaked my back in the hot Jacuzzi, then we packed up our gear and headed down to the marina at 3:00 pm. The “Dragin Fly” was fueled up and provisioned for our Monday to Friday fly-fishing adventure; James had the engines running and air conditioner nice and cool. We boarded the boat, Berto and Roberto untied the vessel and we were under way at 3:30. 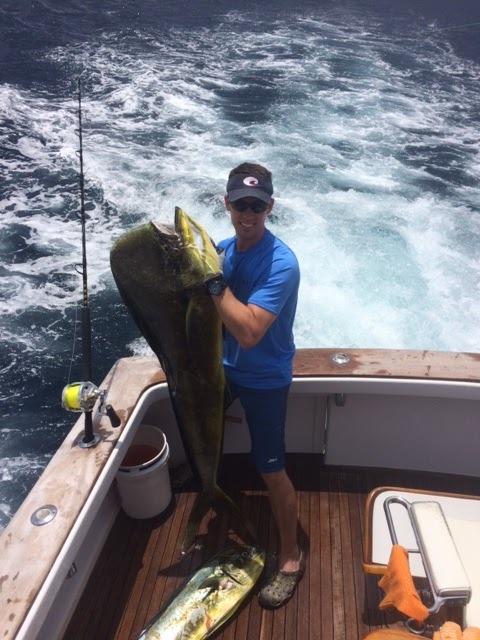 At four o’clock we slowed to trolling speed, the boys put out the teasers while I got the TFO HD Blue Water fly rod, rigged with my Mako #9700 B fly reel, and a RIO Leviathan fly line, ready with a Cam Sigler sailfish fly rigged with 20 pound IGFA class tippet, 100 pound bite tippet, and Gamakatsu Octopus 7/0 hooks, ready for Danny to catch a sailfish on the way out. Well at 5:10 pm a fish came in hot on the long teaser, we cleared the other teasers, while Danny got ready to cast to this fish. 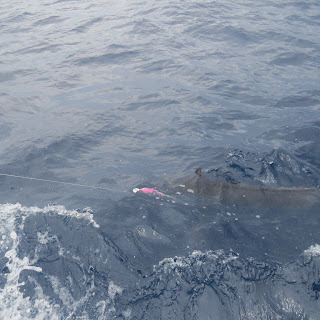 As it got closer, coming in fast we saw that it was a big blue marlin, Danny calmly backed the drag on the Mako reel off from 6 pounds of pressure (Sailfish) setting to 1 pound (Blue Marlin) setting, and made the cast. That three hundred plus pound Blue Marlin attacked that sailfish fly, took off and then jumped three times within 100 foot from the boat then reversed directions and jumped 3 more times as the fish was passing the starboard side of the boat. Danny got within 50 foot of that marlin before the fish kicked it into overdrive and jumped for the seventh time, we saw the fly fall out of the fish’s mouth and it was over. WOW, I really love my job. It got dark at 6:15 and we retired to the cabin for some lasagna which James’s wife made for our first night at sea as we steam along for the next 11 hours at 10 knots We will be asleep by 8:00 PM then hopeful awake at 5:00 am to calm seas as it turns to dawn and we begin our first 13 hour day of fly fishing for Blue Marlin. June 20, 2017: We awoke to the awesome smell of fresh brewed Costa Rican coffee, and sausage cooking. We were 8 miles from BM-X-11 (Blue Marlin Destination X - #11) at 5:00 AM, at 5:30 we put out the teasers and arrived at the Sea Mount at 6:05. Our first marlin raised was at 6:31, it was a small blue which attacked the bird teaser, the overcast skies and glare on the water made it difficult to see the fish after that, Danny made the cast however we never saw that fish again. At 7:30 there is sunshine with clouds and rain all around us, we have a four foot Pacific swell about thirty seconds apart, along with a light chop of about two foot on top of the swells, the wind is under ten knots from the south. There are three other boats herein this area, scattered over two FADs about three miles apart, one boat is my friend Nick Smith aboard his vessel “Old Reliable”, another boat is “Tijera” with Captain Bubba Carter, and the third boat is local charter boat from Los Suenos “Fire Fly”. Not many fish so far this morning, but at 7:58 we raised another blue marlin, it did not tease into the boat, just faded away. 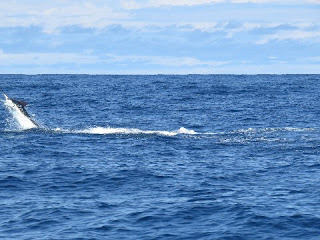 Now at 8:52 am it started raining, we have seen two marlin so far today, as I write this we raised another marlin at 8:55, but lost interest and did not bite. At 11:01 we raised a sailfish, which tried to eat the marlin fly, the hook got stuck on the bill then when the sailfish shook it’s head the fly fell off. 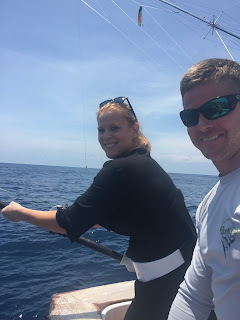 At 11:50 we raised a sailfish, Danny made a perfect cast, and that sailfish ate the fly, five minutes later at 11:55 we released our first fish of the trip, a 90 pound sailfish. Fairly calm seas with overcast skies and 84-degree water temperature make for comfortable fly-fishing. Around 12:30 we caught half a dozen five-pound yellow fin tuna, and at 1:00 pm we enjoyed some fresh tuna burritos for lunch. It is now 2:20 pm and we have been fishing for the last hour and a half in a steady rain, slow fishing this afternoon so far. 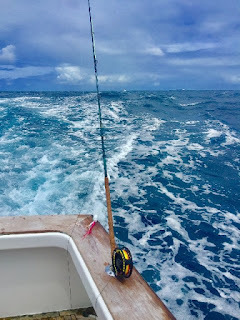 It is now 4:20 pm; it has been raining steady for close to four hours, as far as fishing the last fish seen by the fleet was the sailfish, which Danny caught at noon. Hopefully they turn and we have a late afternoon bite, I love my Job! At 6:00 pm it got dark, our score today was, raised 3 blue marlin and 2 sailfish, got two sailfish bites, and caught one sailfish on fly. We enjoyed a grilled steak dinner with fresh vegetables and a garden salad with blackened tuna. After a 25-year rum we went to bed before 8:30 while the mates were jigging squid, which we will have tomorrow for lunch. June 21, 2017: Up at 5:00 am drinking coffee while waiting for eggs and bacon for breakfast, had a good night sleep, we are ready for some blue marlin on fly. The sky is cloudy, wind under 10 knots, 2-foot chop, with a water temperature of 82.3. At 6:00 we stopped for a few minutes to catch fresh tuna for sashimi, and to catch some Bonita for strip bait teasers. 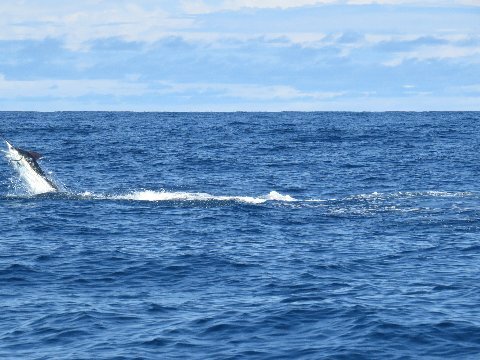 At 6:45 am there are three boats in the area, “Old Reliable", “Tijera”, and “Dragin Fly”, Tijera is fast trolling while Old Reliable and Dragin Fly are fly-fishing, we have not yet seen a marlin. We raised our first fish at 7:14 am, Danny made a great cast, and the 60-pound sailfish ate that big marlin fly. Danny got the leaser inside of 30 seconds, then the fish took off with made some awesome jumps, then about 6 minutes later Berto grabbed the bill and removed the hooks, and released our first fish of the day at 7:20 am. I just heard on the radio that Old Reliable raised a blue and Nick caught it on fly, this was the first marlin on fly caught here since yesterday morning. It is 8:00 am and we decided to fast troll toward another BM-X, which is #4, it is located more than 50 miles from here. Each of the last two mornings I noticed at least one different tuna seine boat in this area, last week we also saw several tuna seine boats near the FAD we were fishing near, (just saying)! I have also noticed that several of the local charter boats from Los Suenos have been live bait fishing for marlin on some of the FADs here in Costa Rica. In my opinion it seems that live bait fishing causes the trolling and fly fishing boats to raise less fish to the surface, and harder to get to bite. This is just an observation by me, as we are a full time fly fishing vessel. At 9:45 am we are trolling teasers at 10 knots about 130 miles from land, in the pouring rain. 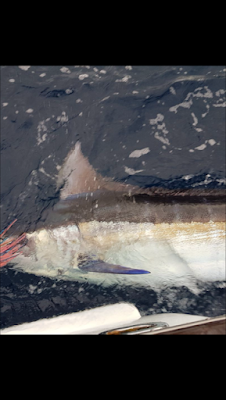 At 10:40 we raised a red-hot 150-pound blue marlin, which came in fast, it ate Danny’s well-presented pink and white popper fly just after he popped it to get the fishes attention. That marlin ran out 130 feet then made a U turn and jumped 3 or four times as he raced up the starboard side of the boat, at this time Danny was within 10 foot of having the leader. After that the fish ran away from the transom as James chased him at high speed in reverse while Danny wound in the running line as fast as he could turn the handle. Again we got within 30 feet from that fish before another powerful run, then on the 13th jump I filmed the fish leap and saw the fly fall out of it’s mouth, we just missed another awesome Blue Marlin on fly. Now at 11:15 am we are trolling teasers in the open ocean while the rain pours from the sky, visibility is less than a quarter mile, thank god for good radar. We arrived at this seamount at 2:10, there was one boat here fishing, and he had seen eight fish here so far today. At 2:40 pm we raised our second blue marlin of the day, this fish came up on the long teaser however did not follow it in for a cast, no bite. At 5:20 we have not seen a fish in the last two hours and forty minutes, rain has stopped, with a three-foot chop. 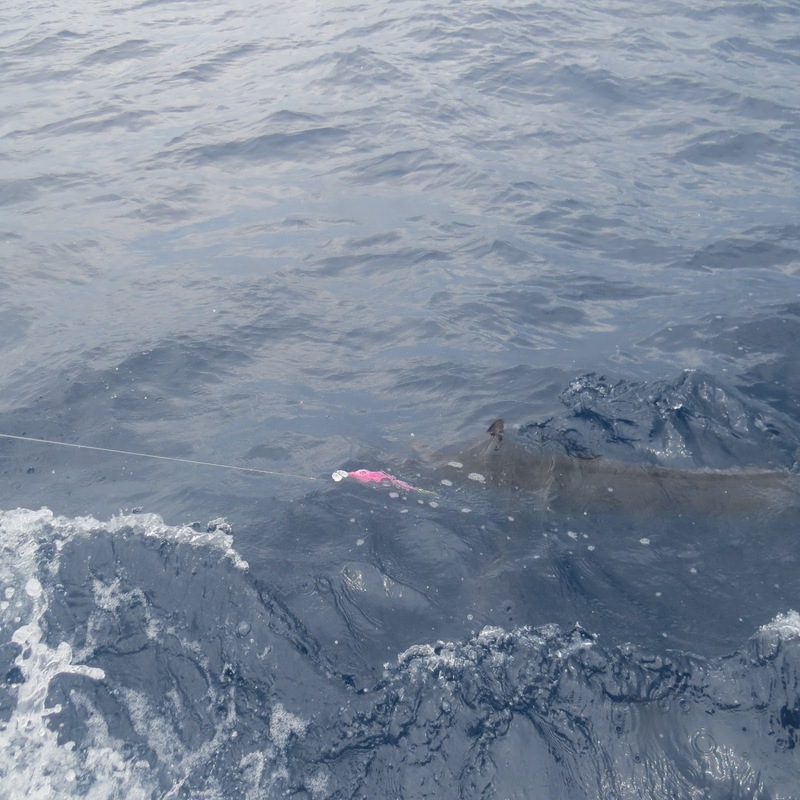 James is marking lots of bait along with some marlin, down deep, we can't seem too get them up to the surface to feed. At 6:15 it got too dark to fish, we pulled in the teasers, and deployed the sea anchor. After a stiff Flor de Cana 25-year-old glass of rum, and a jumbo shrimp dinner we decided that tomorrow will be an excellent day of fly-fishing. Our total score for today was: Raised 2 blue marlin and a sailfish, one blue marlin ate the fly and came off, while the sailfish bit the fly and Danny caught and released that sailfish. Going into our last day, it has been slow, we raised six blue marlin, and three sailfish, we got two blue marlin bites pulled the hooks on both and Danny Cline caught two for three on sailfish. June, 12: Craig, Cliff, and I headed down to the “Dragin Fly” from my condo here in Los Suenos at 3:00 PM where Captain James Smith along with mates Roberto and Sidney, were aboard and ready to head out. We cleared the breakwater, and James put the boat on a plain and ran at cruising speed for 30 minutes, then slowed to trolling speed and put out the teasers. The skies are overcast, with a 12 knot wind, and 2 to 3 foot chop on the water. Cliff is the first angler today, I rigged up my TFO Blue Water HD fly rods, with my Mako #9700 Fly Reels, and put on some Cam Sigler sailfish flies, rigged with Gamakatsu 6/0 hooks and we were ready to fish. As I rite this report it is 6:00 PM and we have not raised any fish so far today. 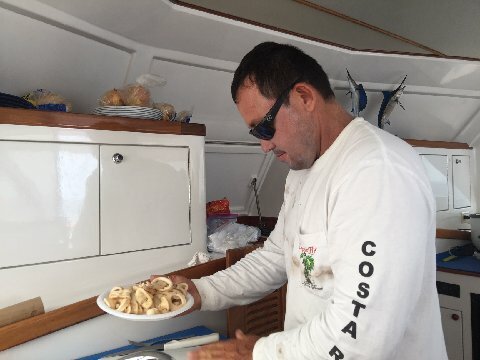 At 6:30 we pulled the lines in as it got dark, at 7:00 Roberto served us awesome cheeseburgers, for dinner and we were asleep by 8:30 in a thunderstorm with rough seas. Tomorrow morning we should arrive at Destination Blue Marlin X-9 (BM-X-9) at 7:00 AM. June 13, 2017, I woke up at 5:00 AM to the smell of fresh Costa Rican coffee brewing , with eggs and sausage for breakfast. Still two hours to the FAD as we were running slower than normally due to choppy seas and heavy rain. Now the sun is out, with a 2 to 3 foot chop and we are trolling teasers ready to cast a fly to a Blue Marlin. We reached (BM-X-9) at 7:16, there is one other boat here, at 7:58 We raised a Blue Marlin which was about 150 pounds, (perfect size), Cliff made a great cast, the fish tried to eat the fly and missed it as Cliff popped the fly to get the marlin’s attention. We re-teased several times bud never got a bite. 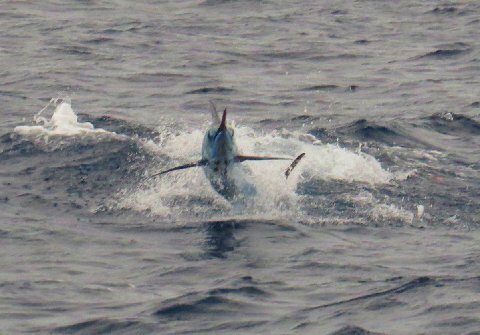 We raised another marlin at 8:43, but it did not tease in for a shot, there are two other boats here trolling lures, I saw several fish caught already on the other boats but we have not raised another fish yet at 9:30 AM. At 11:00 with only 2 marlin raised even though James was marking fish on his machine, they would not tease to the surface, so we left and ran to another sea mount about 9 miles away. Again fish marked but none raised, so we began to troll back to the original FAD hoping to catch the late afternoon bite. 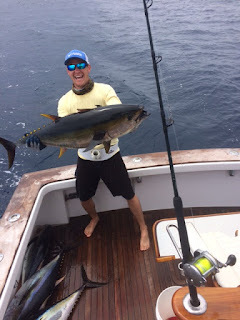 At 2:00 we were half way between these sea mounts when we raised a marlin, it came in and swam around the fly but faded away with ought a bite. At 3:04 we raised another blue marlin near #9, it fame hot to the bridge teaser, then just swam away, no chance. The weather has been unsettled, at times the wind would blow 20 knots with 3 to 5 foot white caps, then calm down show a little sun then another squall would pop up. it is now 3:30 and we are still waiting for a hot marlin. We fished until dark, at 6:00 we raised a striped marlin which would not eat, then at 6:24 we raised a double, cliff made a great cast and hooked his fish, we did not get another cast to the second fish. As luck would have it the fish which Cliff caught was his first sailfish ever, and the other fish raised was a blue marlin. 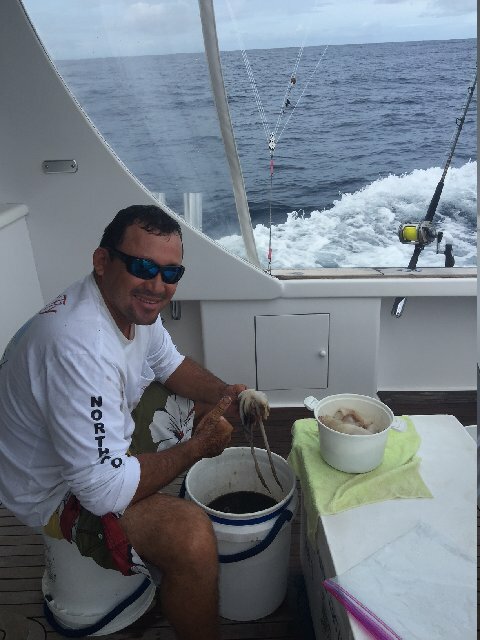 Today we raised 5 blue marlin, one striped marlin, and one sailfish, We got one marlin bite and one sailfish bite, and Cliff caught one Sailfish on fly. At 6:45 we deployed our sea anchor, took showers, and had a great dinner with grilled pork chops, sauté vegetables and rice, with ice cream for desert. All were asleep by 8:30 PM. June 14, 2017: woke up to better conditions with some sun shine and storms on the horizon, 15 knot wind with 2 to 4 foot seas. After coffee, eggs, bacon and toast for breakfast at 5:30 AM we headed back to the FAD which we had drifted 10 miles from during the night. 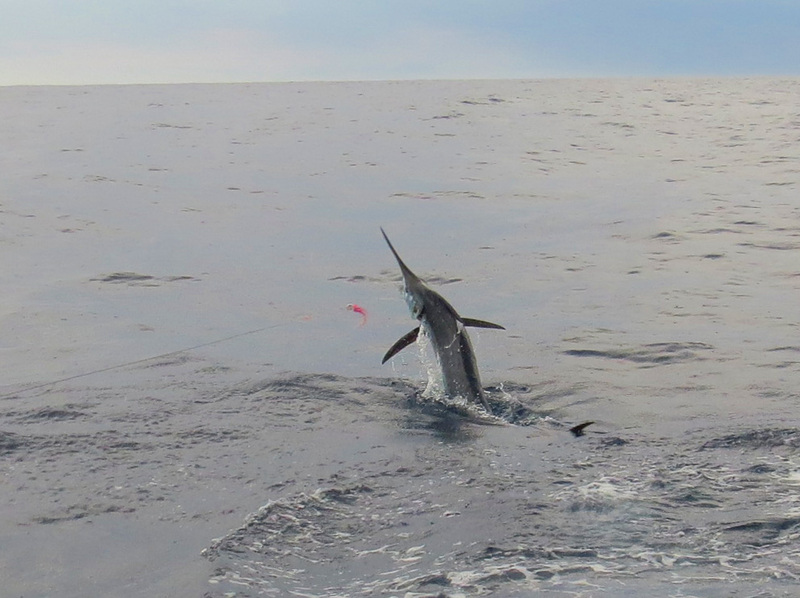 At 7:00 Craig hooked a sailfish, which ran way out and spit the hook during one of its awesome jumps. We then raised a blue marlin at 7:28 AM and another one a 7:35, neither teased in close enough to get a bite. the weather is closing in on 3 sides with cloudy skies and 15 knot winds steady 2 to 4 foot seas. Wind and rain all around us, we did not raise another fish so at 9:00 James decided to head off shore for 27 miles to a sea mount which I call Destination Blue Marlin-X- 11, (BM-X-11). We trolled teasers at 10 knots while we moved, the sun came out and the wind slowly calmed down. At 11:40 we arrived and decided to catch some yellow fin tuna for sushi which took 15 minutes for half a dozen 6 to 9 pound tuna. Then at 12:00 noon we raised a double of Blue Marlin, Craig made a great cast and the smaller of the two piled on and ate that pink and white fly. That marlin ran 100 feet and jumped while heading back toward the boat, the fly fell out go the fishes mouth and instantly the 200 plus pound marlin ate the fly and took off. the second fish jumped several times in a circle then came at us and we saw the fly fall out of that fishes mouth, unbelievable! During the next hour we raised four more Blue Marlin, these fish are acting weird, two went away before we got a shot at them another one swam past the boat and ignored the fly and the other one swam around the fly but never attempted to eat it. By 2:00 we hadn’t seen any more fish and the wind came up while the clouds and rain moved into the area. It is now 2:15, the seas are now 5 feet with whitecaps on top, hoping for more marlin, the sashimi is world class with a great avocado salad. Slow fishing in the rain for the rest of the day, in the rain. Today we raised a total of ten blue a striped very finicky marlin and 2 sailfish, Craig hooked two blues which came unhooked after several jumps, while Cliff hooked a sailfish which he broke off while trying to wind as the fish swam away. Great Linguine with chicken mushroom creamy garlic sauce for dinner, then off to sleep by 8:00 PM. The mates stayed up and caught two five gallon buckets full of squid with a spinning row and squid jig, fresh calamari for those of us who love the taste of it. June 15, 2017: Day three we woke up to ham and egg omelet with toast and sausage on the side, along with awesome Costa Rican coffee at 5:00 AM. 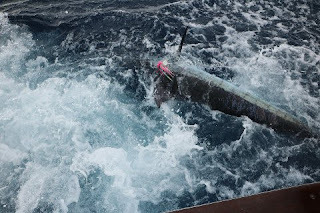 We had drifted 4 miles away from #11, so we trolled back to that sea mount, at 6:00 AM we raised the first blue marlin of the day, no bite, then during the next 25 minutes we raised five more blue marlin and a striped marlin, four would not bite, one ate the bridge teaser and jumped as he raced away, and the other one a fish just under 200 pounds, ate Craig’s well placed fly, an awesome attack bite. As Craig made his cast he did not check the line which was wrapped around the reel, that fish took off and broke the 20 pound IGFA class tippet. Fishing slowed down after that and we didn’t raise another marlin until 7:59 when a Striped Marlin teased in and Cliff made a good presentation, that fish would not eat the fly. Plenty of marlin and sailfish around but they are acting weird, hard to get the bites. There is tons of bait around these FADS, maybe the fish are full? The weather is still unsettled we are surrounded with rain and still are fishing in 2 to 5 foot seas, not bad but would like more sunshine and a little calmer seas. Hopefully they start biting better soon, only 10 hours left of fishing time today. At 10:01 AM a small Blue came in hot, hit the long teaser, didn’t like the taste, and swam quickly away. Then at 10:05 a 200 pound plus, Blue chased the teaser to the boat, then turned off and looked at the fly. After what seemed like s long period of time that marlin decided to fade away not to be seen again. We are fishing more than 140 miles from land in cloudy skies with 15 knot wind, the waves look to be about four foot. 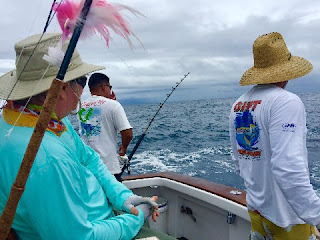 11:00 AM and we just raised a striped marlin which came in but would not eat the fly then at 11:45 a hot double came up on two different teasers, both charged after the teasers. Cliff made a great cast and the smaller of the two blue marlin (150 pounds), ate the pink and white popper fly and raced away in a big circle to the left, then jumped four times while we gained line and got within fifty foot from that marlin before it took off again heading away from the transom. Cliff wound as fast as possible and that marlin started jumping as he charged the boat, after a 7 minute battle that marlin made a great lurching jump and landed on the leader which broke the 20 pound class tippet and the marlin was gone. Now it is 2:00 PM so far today we have raised eleven blue and two striped marlin, two hooked and both lost, we still have about four and a half hours and need a blue marlin to the boat, partly cloudy with 4 foot seas and a light chop. At 2:15 Captain James suggested that we move inshore to FAD #9 where he had just spoke to another captain on the sat phone. We ran 27 miles and then put our teasers back out at 3:30 PM. Between 4:00 and 4:20 we raised 3 blue marlin, Craig hooked one then after 10 minutes chasing that fish it came un hooked, and the other two would not eat a fly. Then at 5:01 we raised a 200 plus pound Blue Marlin, Cliff made a good cast, the marlin pied on that fly and headed south at high speed. 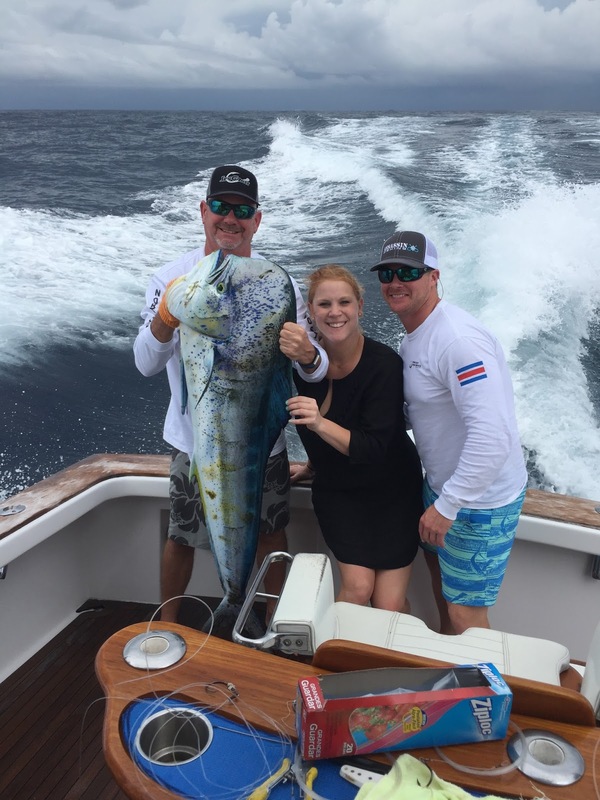 After a long run and a great battle with that fish about 180 yards away and still racing away from the boat, the marlin made a spectacular jump and we saw the 20 pound class tippet break. We keep fishing for the apex predator using a thin 20 pound test piece of string, it is not easy however wen you score it is a great accomplishment. 50 minutes left of fishing this trip we will fish till dark. At six ten it got too dark to see the teasers and we quit fishing, pulled in the lines and began our 12 hour trip back to Los Suenos marina resort. 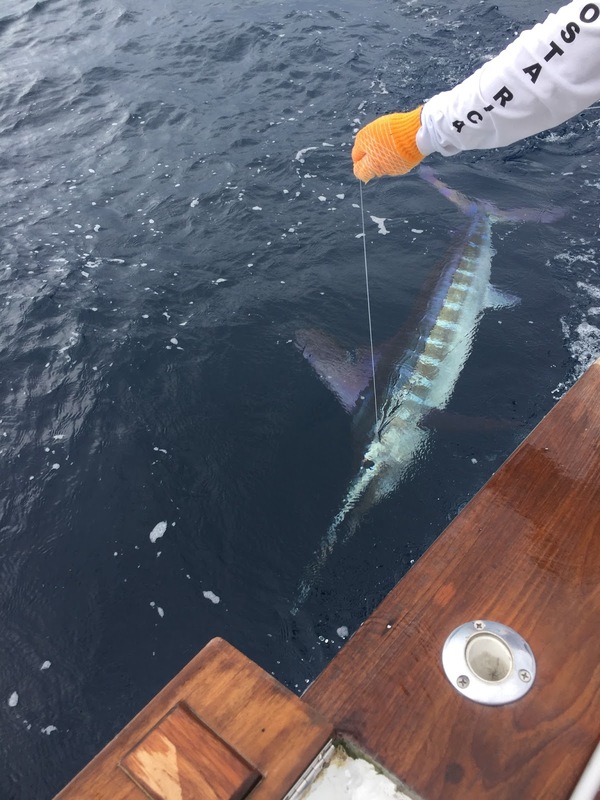 Today we raised 14 blue marlin, and one striped marlin, we had four bites, of which we had two come unhooked and broke the IGFA 20 pound tippet on the other two. Tonight we had shrimp sauté with beans and rice before going to sleep at 8:30 pm, at 6:30 am we arrived at the marina and headed home to my condo where I jumped into the hot tub to loosen up my tight back muscles. 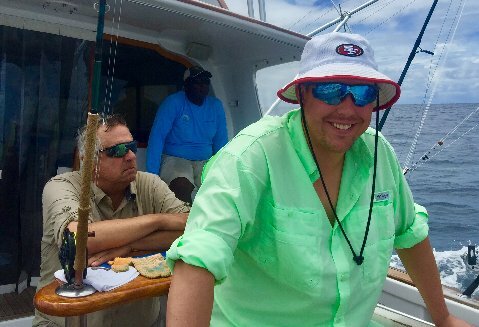 June 16, 2017: Putting together my report from the first of ten "CR Blue Marlin Fly Fishing Schools” from here in Los Suenos Costa Rica during the summer of 2017. My awesome clients Craig and Cliff Machado enjoyed the 42 hours of fly fishing way out in the pacific ocean as we raised 29 blue marlin, 3 striped marlin, and 3 sailfish, they had 7 blue marlin and 2 sailfish eat their flies, of which they pulled the hook on 3 marlin, and broke off 4 blue marlin and one sailfish, Cliff caught and released his first billfish ever and it was a sailfish on 20 pound test IGFA class tippet on the fly. There are plenty of marlin out on these sea mounts, however there is more bait, especially squid, around the structure, it is for this reason that I think the marlin would come up but loose interest quickly. The cloudy, windy, rainy, weather was not too uncomfortable, and the fishing was awesome, Captain James along with mates Roberto and Sidney did a great job teasing and preparing outré wonderful meals, as usual the vessel "Dragin Fly” is one really great fly fishing boat. Craig and Cliff are out of here tomorrow, and my buddy Danny Cline arrives on Sunday. On Monday Danny and I along with James and his crew aboard “Dragin Fly” will be our home next week from Monday to Friday, hope they bite better, stay tuned for more reports to follow, I love my Job. Complete report to follow, but on this 3 day trip, pulling 3 teasers, raised 29 blue marlin, 3 striped marlin and 4 sailfish. Tunas, a big dorado and a nice striped marlin to finish out a two day grand slam. 4 for 6 on sails and a blue marlin, not bad day trip fishing for green season.